High School wrestling action between the Norwalk Bears and the Brien McMahon Senators on Friday January 23, 2019 at Norwalk High School in Norwalk, Connecticut. NORWALK — Victories in high school are nice. Victories that make history are enduring moments that keep on giving. 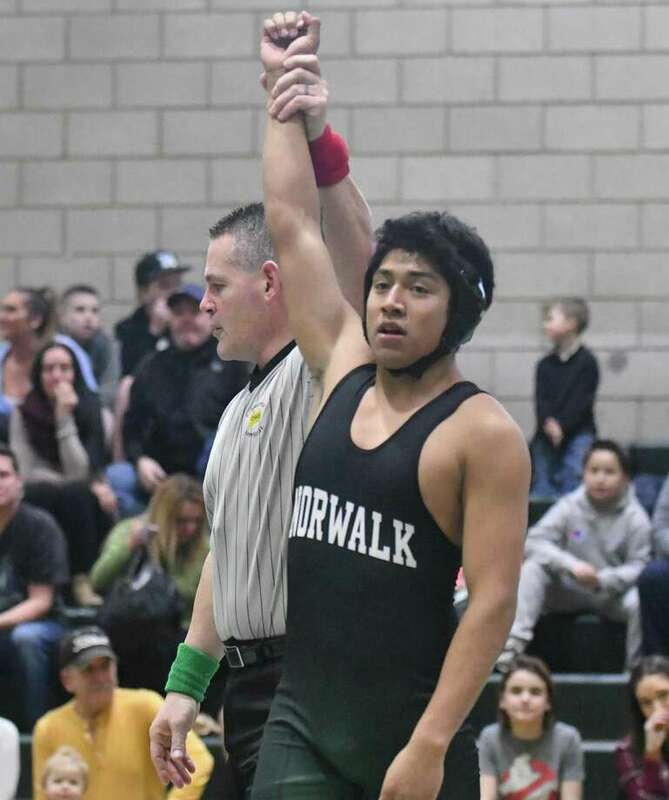 The Norwalk wrestling team put an indelible stamp in Bears history Wednesday night as they rallied to defeat intracity rival McMahon, 39-34 at Norwalk’s Tom Scarso gym. The triumph gave Norwalk the city wrestling championship for the first time in coach Job Fernandez’s 13-year tenure. It was a determined rally by Norwalk (7-3) that brought joy to the home crowd. Starting the match by draw with the 152-pound division, McMahon was able to jump out to a 23-9 edge after seven matches. There was concern but not panic on the Norwalk side. Pins by freshman Jack Cahill (106) and senior Michael Campos (113) along with White’s forfeit win at 120 gave Norwalk a 27-23 lead with four matches left. A pin with 15 seconds left by Norwalk senior Chase Larkin (132) was offset by McMahon junior Mike SantaLucia’s five-point tech fall victory at 138. That left McMahon ahead 34-33 with one match remaining. Norwalk senior Lensendro Laguerre (145 pounds) was feeling the weight of history. Laguerre decided to be the hero as he won by pin in 1:30, touching off an incredible green and white celebration. And Fernandez couldn’t have been prouder of his Bears. “Lucky No. 13. I’m also getting married on the 13th. So 13 is a great number,” Fernandez said. “This victory is the culmination of a lot of hard work. We encouraged the kids to get mat time in the offseason. There’s no substitute for experience. Lots of kids heeded that advice. McMahon coach Joe SantaLucia was gracious in defeat. 152: Victor Espinosa (N) pinned Luis Ledesma, 1:57; 160: Arthur Cocchia (M) major dec. Simon Galeano, 13-3; 170: Jonathan Davilla (M) pinned Chris Muralles, 2:16; 182: Ben Van Steen (M) dec. Anthony Marini, 13-7; 195: Malik Goethe (M) major dec. David Lamb, 13-1; 220: Dante Solano (N) dec. Connor Barton, 4-0; 285: Jeff Cocchia (M) pinned Tom Jakal, :18; 106: Jack Cahill (N) pinned Matt Greco, 2:51; 113: Michael Campos (N) pinned Solomon Wycliff, 3:59; 120: Sam White (N) winner by forfeit; 126: Hugo Romero (M) pinned Aiden Donohue, 1:14; 132: Chase Larkin (N) pinned Adrian Coella, 5:45; 138: Mike SantaLucia (M) tech fall Cesar Rivera, 20-4; 145: Lensendro Laguerre (N) pinned Ryan Hernandez, 1:30. Records: Norwalk 7-3, McMahon 1-7.